Having a missing tooth can make your life more difficult on so many levels. Fortunately, with modern oral surgery techniques, you don’t have to allow those gaps in your smile to create problems for you. Dental implants are now the preferred way to replace missing teeth. 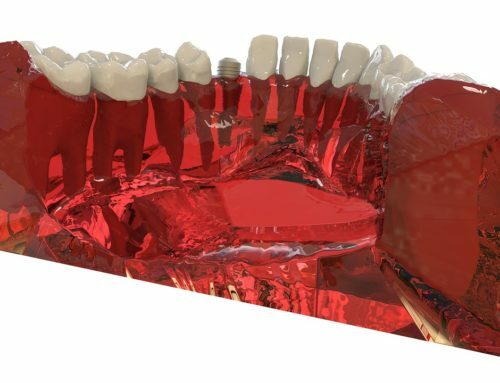 These devices are prosthetic (man-made) replacements for teeth that have been damaged or lost due to tooth decay, gum disease, accidents and other causes. Through a process known as Osseointegration, the dental implant forms a close bond with your natural bone, making it just as sound and secure as your original tooth. Dental implants can be removable or fixed. Whatever form they take, these replacement teeth will have tangible benefits when it comes to preserving your good health and peace of mind. Having one or more missing teeth can make it difficult to chew your food. If there’s a gap in your smile, you’re probably favoring one side of your mouth when you eat, putting extra wear on those teeth – which can compromise them over time. Dentures are another solution that, while popular, they only offer a fraction of the bite force that natural teeth can. Healthy food choices such as fresh fruits, vegetables and nuts may be especially hard to enjoy with dentures. But with dental implants, you’ll be able to chew just as effectively as with your original teeth. Efficient chewing supports better digestion and overall health. Gaps in your teeth can cause other teeth to shift position, which may lead to expensive procedures down the road. Dental implants solve this problem by naturally filling in for missing teeth, supporting neighboring teeth to maintain the healthy smile that’s so pleasant to look at. Having implants can be healthy for your budget, too! They are maintained using the same oral care products as your regular teeth. Dentures, on the other hand, need to be taken out and cleaned with special products to keep them in good condition and require regular adjustments to keep them fitting properly. Dental implants can save you time and greatly simplify your oral care routine. Dental implants give us peace of mind, which supports our mental health and well-being. When we’re embarrassed about the way our teeth look, we may be more reluctant to speak in public, smile or laugh with family and friends or take an active role at work or in the community. Dental implants offer a natural look that restores confidence and comfort in our daily interactions with others. Dental implant surgery doesn’t have to be complicated. In fact, with the proper planning, the procedure is simple and comfortable. As an experienced oral and maxillofacial surgeon, Dr. Farole has restored smiles for thousands in Bala Cynwyd and Greater Philadelphia. He will be glad to help you determine if dental implants are right for you. If you have damaged, loose, or missing teeth, call our office today to schedule a personalized consultation with Dr. Farole.